The Butterwort family of plants (Pinguicula) is another species of insectivore. The plants themselves are fairly plain in appearance. Their name is derived by the buttery, sticky, greasy mucilage which covers their leaves. Their extremely pretty flowers, however, usually make up for these shortcomings. The Pinguicula family of plants capture their prey using a fly paper approach. Insects that are attracted to the plant become stuck in the leaf's sticky coating. Then they are digested through the action of the enzymes in the plant's slime, and become nutrients for the plant. On certain varieties of Butterworts, the leaf margins slowly fold over and entrap the insect before the digestive process begins. Butterwort plants are suitable for growing in unsealed terarriums. Butterwort plants should be grown in a mixture of sphagnum moss, peat moss and perlite (or coarse builders sand). Butterworts grow best when they receive several hours of sunlight each day. Butterwort plants will tolerate a wide range of room temperatures (60-90 degrees) as a house plant. Butterworts will naturally go into a dormant period (like many of the sundews). 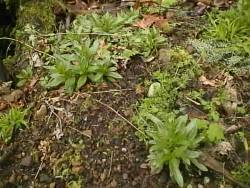 When this happens, the plant will take on a new appearance, forming many new, small leaves around the head called a hibernaculum. Butterwort plants require a varying amount of moisture, depending on the species, so investigate the needs of your particular plant. Pinguicula planifolia requires very wet conditions, and can even survive submerged in water for extended periods of time. Pinguicula caerulea and P. lutea are most often found on drier ground, but should never be allowed to completely 'dry' out. Before you leave please read How to Grow Carnivorous Insectivores.